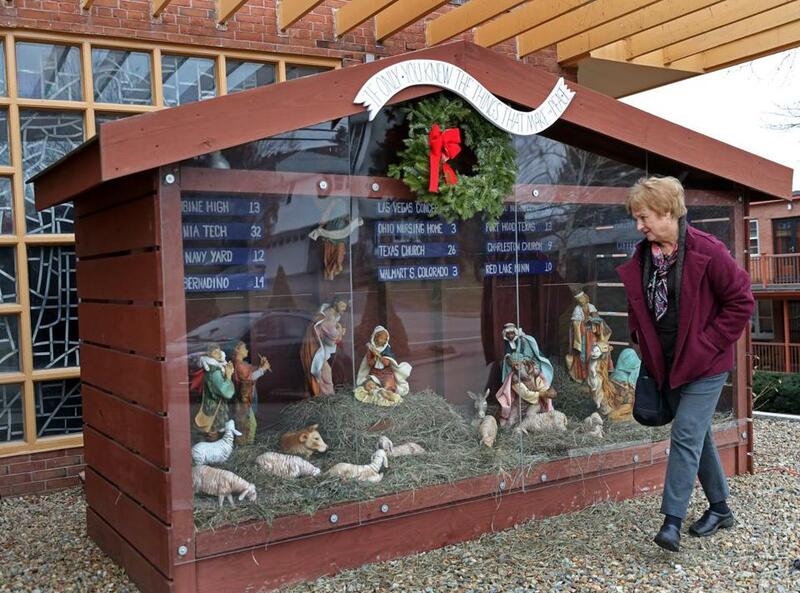 Pat Ferrone helped put together the Nativity scene outside the St. Susanna Church in Dedham. A nativity scene in front of a Dedham church bears a different holiday message from the traditional sentiment for “Peace on Earth” — and it is stirring national conversation about gun control. Last weekend, parishioners at St. Susanna posted 16 signs on the back wall of the “stable” in the nativity scene listing some of the country’s most horrific mass shootings and the number of victims killed in each incident. The litany includes Columbine High School, Pulse nightclub in Orlando, the Las Vegas concert shooting; and San Bernardino. The Rev. Stephen Josoma said the idea to place the names on the wall behind the statues of Mary, Joseph, and the baby Jesus in front of the church came several weeks ago during a meeting of the congregation’s Pax Christi group, part of an international peace movement. Every year the group tries to do something different, he said, to raise awareness around specific issues, especially nonviolence. The meeting led to a discussion about the country’s mass shootings, and soon after came the creation of the signs. Josoma said the congregation hopes the display provokes thought and conversation about the work that still needs to be done to bring about change in the country so such shootings no longer occur. Since the display went up last weekend and made national headlines, Josoma said the church has been receiving calls — positive and negative — from all across the country. No one has asked the church to take down the signs, he said. Josoma understands that the signs seem to politicize the holiday season and what is supposed to be a time of good cheer. But he said they also speak to Jesus’ message of peace. As a society, people shouldn’t allow this type of violence, he said, but they do. 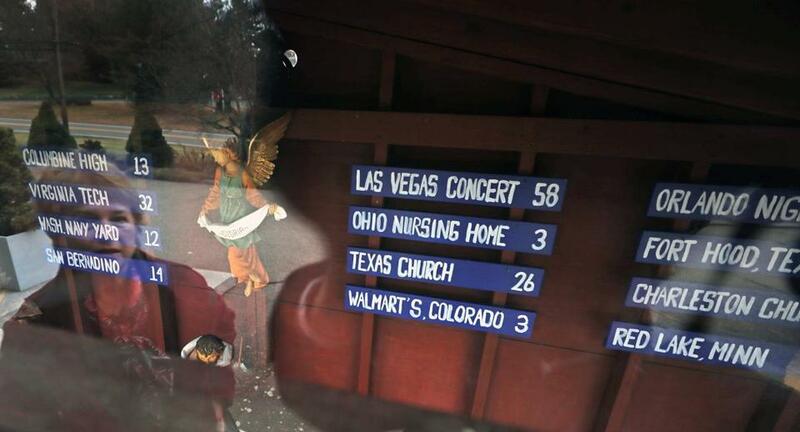 The Nativity scene outside the St. Susanna Church in Dedham shows list of locations where mass shootings have occurred and the number of victims.